Family is important and at Dunn Environmental Services keeping them safe is our priority. To ensure this, our representatives undergo extensive pre-employment screening, background checks, and drug testing. Once a part of the team, each employee must complete a rigorous training program before they may represent our company. At Dunn Environmental Services, we understand the importance of an educated, friendly, and consistent service professional. We’ll always provide a prompt return phone call, as well as a correct and simple to understand solution. It is this uncommon commitment to customer satisfaction to always treat our customers with courtesy and respect, deliver an exceptional customer service experience, and strive to provide the best pest control…that’s the Dunn Environmental Services Promise to you ! 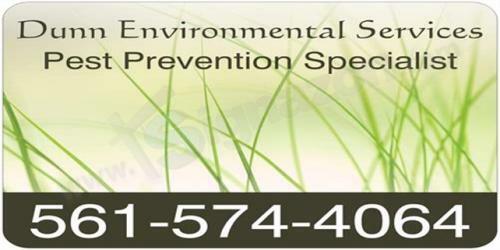 Dunn Environmental Services provides peace of mind with premium pest protection and prevention. We provide residents and business owners pest control to Palm Beach county and surrounding areas. Our services include routinely scheduled maintenance pest control on a weekly, bi-weekly, monthly or quarterly basis as needed or desired.